I'm starting to really see the value of 30 Days of Lists now. We're getting to lists that I would never have thought to make myself, and I should be making them. 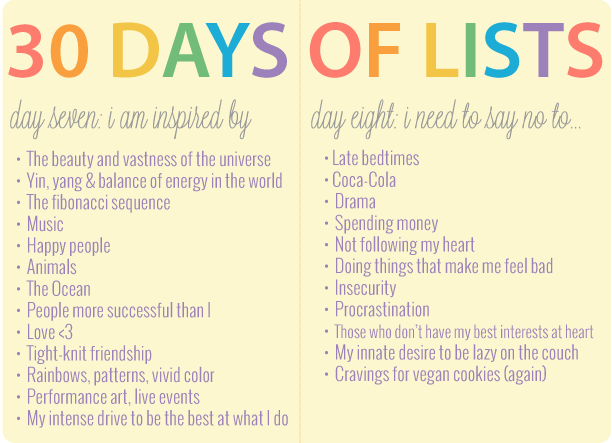 Reading the lists below, for example: first, it makes me feel really good to see how I am inspired by so much goodness in the universe; and second, my list of "things I need to say no to" reflects a number of things weighing on my mind right now. It's beneficial to write things like this down; I've figured out over the years that after you write them down, they become more real. You know? It can be scary sometimes, but always worth it.